My cousin recently sent me an email asking where she could find the Rachael Ray Cookbook Holder. Surprisingly, Rachael Ray has a microwave with her name on it, but no cookbook holder. And some of her cookbooks, like 365: No Repeats, are pretty thick books. 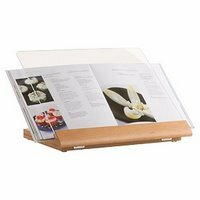 I have had this cookbook stand from Crate and Barrel for a couple years. It fits all my Rachael Ray cookbooks and has held up well despite repeated use. The wood matches my kitchen (of course) and the sheet of acrylic protects cookbooks from my clumsiness.